This is a man who has spent most of his life, he’s 56 this year, as a compulsive overachiever (famously, he earned the title of ‘Dr.’ at the tender age of 22 when he wrote his thesis, ‘Reasons of State’, a text that remains compulsory reading for many students of Indian foreign policy). However, a controversy in 2010 centred around the IPL Kochi franchise had his party asking for his resignation. Having declared his innocence, Dr. Tharoor is back in the fray and is considering a new book. Below are excerpts from our interview, conducted partly in person and partly over email.His books include ‘India: From Midnight to the Millennium’, ‘The Elephant, the Tiger and the Cellphone: Reflections on India in the 21st Century’ and the novels, ‘Riot’ and ‘The Great Indian Novel’. 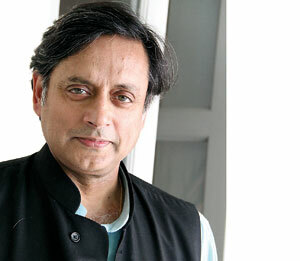 However, writing is something that he’s always done on the side, Dr. Tharoor tells me. His ‘day jobs’ at the UN and now in the Indian parliament have claimed the lion’s share of his time. Your father loved to introduce himself as ‘the author’s author’. He sounds like an unusual man. Would you tell me about him? My father was an amazingly unusual man. He was a self-made man, the child of a farmer who died when he was 10. My father recounts walking barefoot eight kilometres to school every day from the village. He had a tough upbringing. The elder brother – much older, 17 years older – went away and made good and then took the younger brothers with him to England and so my dad was able to move suddenly from a village life of poverty to go off and study in England at the end of the second WW. He taught himself English reading Byron and Shakespeare and he wrote beautifully. He wrote mainly letters, and these are gems of correspondence and human contact. He was an amazingly broad minded person for someone growing up in a village in Kerala before the Second World War. It’s amazing that someone like that existed. I am desperately fond of him. He passed away when he was only 63 and the pain still lingers now, 18 years later. One doesn’t quite overcome it. I’ve often wondered whether God made me the way I am or my parents made me the way I am, but I can’t now do only one thing. I react to the world both through my intellectual reactions if you like, which is what comes out through my writing, but also as a man of action, as someone who wants to deliver results and that manifests itself in my work and both to me are fully necessary. I think if I gave up one or the other, a part of my psyche would wither on the vine. Even though you weren’t in India when Indira Gandhi declared Emergency in 1975, it had a profound impact on you. Did it discourage you from joining the Indian Foreign Service? I didn’t take the government exams and I’ve written about this in ‘From Midnight to Millennium’. I felt that as a student during the Emergency, knowing that our government could do such things, and suspend the constitution, at least for a year and a half, that made me profoundly unwilling to serve the government and so I actually did a PhD as a way of postponing the decision to take the IFS exams and then when I joined the UN that was that and I never looked back. After having had a UN career, however, when I wanted to explore my options, the hankering to serve my country came right back again. It had never really left. A lot of my books were about India, a lot of my writing was the perennial scratching of a psychic itch about India. In a time when so many people are disillusioned with the U.N, what was your own experience of the organisation from the inside? I was privileged that my 29 years in the UN were all areas that were action-oriented. I began in the UN High Commission for Refugees. It was then so small that we all knew each other by our first names and it kind of grew under me, while I was there because of all the dramatic global crisis that happened soon after I joined the UN in 1978. From the Vietnamese ‘Boat People’ crisis to the Central American crisis to the invasion of Afghanistan, everything happened almost simultaneously, and it suddenly became a very large and serious organisation. But it began very small and I was able to crest that wave of exciting jobs, heading the UN operations in S.E Asia, in Singapore that is dealing with the cases of refugees rescued at sea and those coming into Singapore. Then after 11 ½ years of that I moved to peacekeeping, again when it was very small, when we had only five people, five civilians and three military in the entire peace keeping staff in New York. I found myself not only being Assistant to the then Under Secretary General Sir Marrack Goulding, but I also ended up being the person handling the Yugoslav crisis when it erupted. It became the largest peacekeeping operation in UN history and there I was helping run it from New York. So I was very lucky, very busy and given tremendous responsibilities throughout my career. I then worked in Kofi Annan’s immediate office when he was Secretary General and finally ended up as Under Secretary General with 800 staff in 77 countries around the world. So I ended up at no point having a dull day or feeling underwhelmed or under challenged until I tried for the top job and lost it. Lost it narrowly but lost in nonetheless and felt I should move on. You were so close to becoming the UN Secretary General. It must have been very disappointing. It was because I had overlooked the simple reality that this was not a job where the guy with the best resume makes it. And I think I would be unnecessarily modest if I didn’t say that I had the best resume as a resume. It’s a political job and there are political considerations on the minds of the 15 countries voting on the council. From their point of view – the then American ambassador to the UN has written a very indiscreet memoir in which he has said that his instructions were to the tune of America didn’t want a strong secretary general and there were bilateral considerations with South Korea for example that would have come in the way of that choice and so on. I have absolutely no resentment about that, that’s the way the game is played. I came in an honourable second, in a race with seven contenders that included a serving president, a number of prime ministers, deputy ministers, foreign ministers, so for me as a mere UN official to be able to do that was enough satisfaction back from that experience. Are you sometimes surprised to find yourself in politics after all? I’m certainly surprised to find myself in politics because I don’t come from what is considered the traditional political pedigree i.e is either coming from a political family…there was a study by Patrick French in his book recently where he established that every member of the Indian parliament under 40 (or was it 45? I can’t remember) was a son or daughter of a politician. It worries people obviously because the feeling is that it shouldn’t be such a closed world but it is. Someone like me would have been a complete misfit in the normal course but I have been privileged to have been given an opportunity by my party president Sonia Gandhi to contest. Then I had to go out there and prove I could do it. I had to go out there in the hot sun in Kerala, talking a language I hadn’t used for three decades or at least only in a very, very limited context. I had to get the message across that I could be someone they could trust to get their message across in the national context. You’re frequently accused of being elitist – did it concern you that they would not respond? It was precisely because I anticipated that sort of criticism that I felt I should go the Lok Sabha route and go into the Lower House…I felt it was necessary to earn my credentials as somebody who could connect, but it didn’t stand me in any good stead, after having won the election I still found that I had attracted the deep resentment and hostility of many members of the political class and that is something I probably have not fully overcome and this is people who have done politics all their lives and are probably never going to see an interloper like me, someone who has come from a totally different background in life as somebody who is honing in on their patch. Does the fallout from the IPL controversy linger? From the outside, it looked like it was the charges against your integrity that seemed to cut deepest at that time. Yes, after a lifetime of leading a life unblemished by the slightest taint on my integrity, it was hard to be falsely attacked for that. But it also cut deeply to give up a job that I enjoyed and felt I was doing rather well, that of helping shape and shepherd my nation’s place in many parts of the world. Was the decision to dive back into the fray a difficult one? I never really left. I’m not a quitter. I stayed, licked my wounds, and continued. I gave up a great deal to make my foray into Indian politics, and I wanted to stay true to the convictions that had brought me into it in the first place, even if my idealism had taken a bit of a bruising. Your writings – both fiction and non-fiction – have been about India or based in India almost without exception. What makes the country and ‘the idea of India’ such a rich source of inspiration for you? I look in the mirror and I see an Indian, that’s who I am. I grew up in India from age 2 ½ to age 19 ½ and my spirit was shaped by the experience of being Indian and to me therefore a lot of my own creative energies have been spent in exploring what it means to be Indian, what it means to be Indian in the world. On the bookshelf are some of the products of that exploration. I suppose my commitment to India was always something of a conscious choice, since by birth I was entitled to a British passport, and my long residence in the US could have provided an American option for me as well – but I never sought either. I grew up convinced that India was the most interesting country in the world and that it was a privilege to be part of its narrative – let alone help, in a small way, to shaping it. Just 140 characters leave a great deal of room for misunderstanding – post-several mini-controversies over your tweets, what has kept you online and tweeting? Imagine you can send something out and 1.2 million people read it. The 140 character limit actually has one very valuable plus point and it means it takes very little time to write… Having done that of course, there are pluses and minuses because even if you do feel it takes less time the consequences of an ill guarded remark can take a lot of time. I’ve been there and you’re far more liable to misinterpretation because you have to be brief. I began tweeting because I was so thrilled that there were actually three hundred odd people who wanted to follow me as soon as somebody opened an account for me. I really actively started tweeting the day the election results were being counted. As I went around seeing the results and I was getting more and more confident that I would win. What does 2012 hold for you? Do you have any new projects planned? Always, though what is unplanned often turns out to offer the most interesting experiences! The first priority is to find a 25th hour every day so that I can finish the book I’ve been struggling to find the time to write… It’s a real frustration. It’s a non-fiction book, though I have various ideas for novels bubbling away in the back of my head, at this point, as someone relatively new in politics, I believe my first book after entering politics ought to be on a subject of policy interest and this is also a subject that matters to me – India’s foreign policy and its place in the world. We’ll see how that goes. Published in the Sunday Times, Sri Lanka on 22 January 2012. Words by Smriti Daniel. Pix by Indika Handuwala. Tags: Shashi Tharoor on politics, tweeting and being Indian. Bookmark the permalink.